People who live in small spaces know the importance of something many others take for granted: light. Light immediately makes even the tiniest living spaces seem larger, more cheerful, and inviting, but in a small apartment with only a few windows, natural light can be scarce. Does this mean small apartment dwellers are doomed to live in dim dreariness or pay high electric bills? By no means! Natural light enhancement, artificial lighting methods, and other creative devices can be blended together so that visitors would never know your small apartment was ever light-challenged. When trying to create a brighter living area, the first area to focus is natural light – the light you already have filtering through your windows. Why? Because it won’t cost you a thing! So how can you make the most of it? One of the habits we have when attempting to create a personal space is adding homey touches: curtains, rugs, throw pillows – you name it. If your new space is light-starved, however, adding heavy drapes is one of the worst things you can do. When it comes to windows, less is more. Not only do bare windows allow the maximum amount of light to enter rooms, they create the illusion of more space by visually ‘extending’ the room right through the window! If you live in an upper-story apartment where you don’t have to worry about peeping toms, you’re all set, but if you must have curtains, opt for sheer, light-penetrable neutral colors. Better yet, put up shades you can adjust for maximum light during daytime hours. Even if you’re taking advantage of all the natural light you can, you’ll need some artificial light, as well. 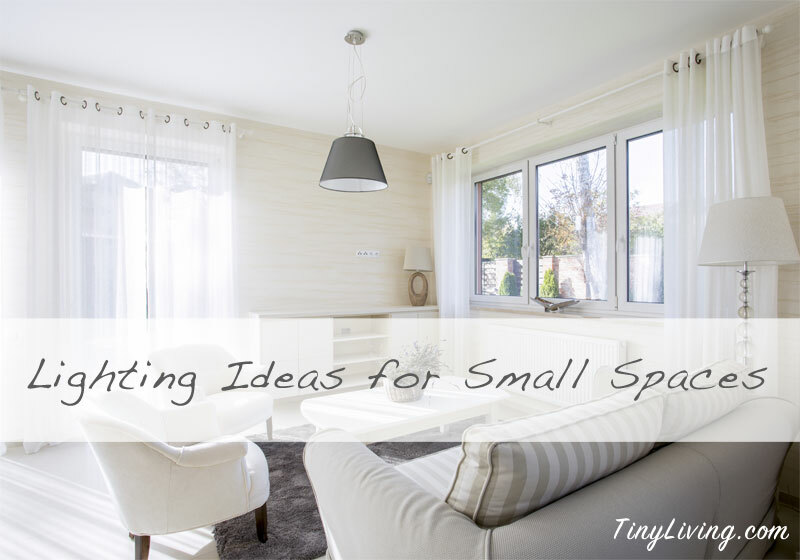 The following fixtures and tricks of artificial light can be played up to create brighter rooms and make small spaces look larger than they really are. Recessed, inset, and soffit lights – Usually built-in, these are known for creating over-all soft, ambient light that reaches those dim areas beyond your windows. If you have inset lights, point them at walls instead of the floor for fewer shadows. Valance/track/runner lights – These lights are commonly mounted under kitchen cupboards, on ceilings, and along the top of walls. Track lighting is particularly suited to small areas because you can easily direct light where you need it the most. Under-cabinet lights are the least expensive, and easy to install yourself. Sconces – Battery powered sconces are easily mounted on walls, and can add a tremendous amount of light (not to mention personality) to your small space. For a more intimate feel, opt for the candle variety. String and hanging lights – Whimsical string lights hung over your kitchen cabinets or along the top of moulding are unobtrusive, yet create a warm, cheerful touch. Pendant lights add coziness to dining and living areas and create dimension in otherwise small or architecturally plain spaces. Desk lamps for ambiance – Do you want that softly-lit look without adding a floor lamp or fixture? Utilize a desk lamp you might already have by pointing it toward the wall or ceiling. The reflection of mirrors is naturally space-creating, and also a classy and inexpensive way to maximize natural lighting. For instance, mirrors mounted directly opposite a window reflect and double the light it receives. You can also ‘extend’ a small corner window by placing an identically-sized mirror adjacent to it. Do you have dark corners the light never seems to reach? Experiment with a mirror to angle light from a window towards the corners of a room. Mirrors can even help you get the most out of natural and artificial lighting at the same time when placed behind lamps or candles. Smaller mirrors on walls or bookshelves throughout the rest of your living space can further add light and visual ‘breaks’ to other surfaces. Mirrors are versatile, but they can be overdone. Other reflective surfaces create a similar effect to mirrors without turning your apartment into a fun house. Adding metallic pieces to your décor will dd even more light to your space. Living in a small home presents unique lighting challenges, but nothing that can’t be overcome with a little knowledge and creativity. Consider a few of these ideas to maximize your daylight, night light, and all the light between your walls.